When you type “Pfalz” as an entry in an internet search engine, you shall receive numerous results containing information about a region in the south west Germany that for centuries has been famous for wine production. However, when you scroll down the results you will find information concerning the Pfalz E.I, Pfalz D.III or Pfalz D.XII. After clicking such link you will learn that those were aircraft built during the Great War in Bavaria in the state of Rheinland-Pfalz. Products of the Pfalz GmbH Flugzeugwerke were well known between 1915 and 1918 and were used by units on all fronts of the war. The Pfalz GmbH Flugzeugwerke produced the third largest number of fighter aircraft in the German Empire. Bavaria as the second largest state of the Keiserreich Germany had its own armed forces including the air service Königlich Bayerischen Fliegertruppen (KBF). The Bavarian government’s intention was to supply its forces with equipment produced by domestic industry. One of the factories producing aircraft was the Gustav Otto Flugmaschinenwerke in Munich. In July of 1913, three brothers, Alfred, Ernst and Walter Eversbush1, supported by funds from Richard, Eugene and August Kahn, built an aircraft factory in Speyr upon the Rhine River and named it the Pfalz GmbH Flugzeugwerke. With limited funds and lack of experience in aviation industry, the owners were forced to buy a licence for aircraft production. Negotiations with the Albatros GmbH works failed as the manufacturer demanded too much money for the licence. The Bavarian Gustav Otto Flugmaschinenwerke factory offered an attractive contract. The company belonged to Gustav Otto, one of the German aviation pioneers and constructor of biplanes inspired by the French Voisin. The Otto biplane with a pusher propeller, powered by a 75 kW (100hp) Rapp engine, seemed to be perfect for the new-born Bavarian air service. Initially the aircraft were manufactured in an empty festival hall in Speyr. The owners’ talks with the City Council resulted in a purchase of 7,000 m² area near the Speyr airfield where they built a factory which launched production in 1914. Meanwhile, the French aircraft manufacturers, brothers Morane and Saulnier, sent a lucrative offer for licensed production of the great Morane L and Morane H. One of the Everbusch brothers, Walter2, was sent to Paris where he graduated from the Morane and Saulnier brothers’ pilot school. Financial conditions put forward by the Marane-Saulnier works enabled the Speyr factory to begin licensed production3 of the Morane Saulnier MS L and MS H aircraft. Their manufacture was launched almost simultaneously with that of the Otto aircraft. Until the beginning of the Great War in July 1914, three Otto, three Pfalz4 A.I (MS L) and three Pfalz E.I (MS H) aircraft were built. The machines were sent to the KBF. The Pfalz A.I and Pfalz E.I aircraft were powered by Oberursel U.0, 60kW5 (80hp) rotary engines. The production increased with the outbreak of the war. The Kingdom of Bavaria participated in it as part of the German Reich. The aircraft produced by the factory were sent not only to combat units of Flieger Abteilung but also served at pilot schools. A total of 61 Pfalz aircraft were built with numbers from P.1 to P.616. A breakthrough moment was an invitation to demonstration of synchronization gear, constructed by the Fokker company, that allowed to fire through a propeller arch from a fixed machine gun. The gun was installed on the Fokker M.5 monoplane whose construction was similar to that of the Morane-Saulnier H and thus to the Pfalz E.I. The Fokker was slightly faster, manoeuvrable and rugged7. The synchronized machine gun was also installed on the Pfalz E.I. Like the Fokker monoplanes, the Pfalz E-type fighters underwent such modernizations. The Pfalz E.II was powered by a stronger engine and featured wider wingspan and longer fuselage. The E.II had three sets of wires bracing the wing (also used for its twist8) instead of two in the E.I. The aircraft was powered by a 9-cylinder, 75kW (100hp) Oberursel U.I engine. One hundred thirty Pfalz E.II fighters were built between September 1915 and February 1916. The Pfalz A.II was the Pfalz A.I powered by the Oberursel U.I engine. Its version armed with a synchronized machine gun was the Pfalz E.III. The fighter’s speed was similar to the E.II but it was less manoeuvrable and its climb rate was lower. In June 1916, seven Pfalz E.III aircraft served in combat units. As an experiment, the Pfalz P-59 was rebuilt into a single-seat fighter with its wing lowered and placed just above the fuselage. The machine was named Halb-Parasol. The construction improved visibility above and below. The wing used was that of the Pfalz E.II with triple wing braces which controlled the wing twist. The Halb-Parasol was powered by the 60kW (80hp) Oberursel U.0 engine and was not armed. Performance of the modified Pfalz was poor and the design was dropped although it was approved9 as fighter aircraft. Another parasol modification was a biplane. Only a prototype was built. The Pfalz A.I and A.II fighters serving in Flieger Abteilung 9b were fitted with bomb racks containing ten10 4.5kg Carbonit11 bombs. The aircraft armed with bombs were flown only by a pilot since the observer would increase the plane’s weight. Such planes flew over the front in Tyrol (Italian front) as part of the German aid12 to the Austro-Hungarian Monarchy. The Pfalz E.IV was another attempt to increase the monoplane’s performance by mounting a 14-cylinder, 118kW (160hp) Oberursel U.III rotary engine. To balance the heavier engine, a longer fuselage was needed. The fighter was armed with two synchronized machine guns. The double row of cylinders in the Oberursel U.III engine caused cooling problems and the aircraft’s performance only slightly exceeded that of the Pfalz E.II. Only 46 fighters were built but only a handful of them saw action on the front. They were easily recognizable by additional cooling holes in the front part of the engine cowling. The E-type Pfalz was mistaken for the E-type Fokker not only in Germany but also by the Entente pilots. Thus, encounters with the Fokker E were most frequently reported although the Pfalz fighters had different paint scheme. They featured black cowling, black outlines and black forward fuselage. The pattern led to the E-types being referred to as flying death notices (newspapers outlined death notices in black). The main disadvantage of the Pfalz (Morane) were difficult flight characteristics which forced the pilot to concentrate on the controls. The aircraft could perform an uncontrolled manoeuvre any time, especially during take-off and landing. Thus, experiments with stabilizers and ailerons were conducted. Between 1915 and 1916, experimental biplane machines were built by the Pfalz factory. They were the biplane version of the Pfalz A.I inspired by the LVG B.I biplane used by Flieger Abteilung 9b. The Pfalz E.V was a version based on the construction of the Pfalz E.IV, powered by a six-cylinder, 75kW (100hp), water-cooled Mercedes D.I in-line engine. The aircraft’s performance was better than that of a machine powered by a rotary engine with comparable power. The weight was increased due to the water-cooling system which forced limitation of armament to one machine gun. The aircraft passed the Typenprüfung flight tests in July13 1916. An order for fifty Pfalz E.V fighters was placed to keep the production flow, however, new, better D-type biplanes entered the war. Of the 50 planes ordered, only three were sent to the front line units. Two Pfalz E.V fighters were delivered to the Navy air service. That was not the end of the E-type development. The Pfalz E.VI was built in May 1916. It was powered by the Oberursel U.I engine, had a different rudder shape and two sets of wing bracing wires instead of three. The fighter was armed with a single synchronized machine gun. Twenty aircraft were built and sent to flight schools. None of them saw any action on the front. It is worth noting that many Pfalz A and E fighters were fitted with engines from captured French and British machines. They were mostly 81kW (110hp) Le Rhône engines. The refit was usually done in combat units. The aircraft’s weak construction was the cause of numerous accidents. A total of over 100 Pfalz fighters were destroyed. Their parts were salvaged to repair other damaged machines. The cost of losses sustained by the Bavarian and German air services exceeded 1,500,000 DM. In the spring of 1916 the Idflieg14 proposed the main aircraft manufacturers to construct a biplane fighter armed with twin synchronized machine guns. The first to respond were the Halberstadt, LFG Roland, Fokker and Pfalz companies. In the summer of 1916, the Pfalz works began working on their D-type aircraft. The design bore resemblance to the Pfalz E – a wooden truss fuselage with a square cross-section and a top wing based on the Roland D.I, attached to the fuselage. The Pfalz D.4 was powered by a water-cooled 110kW (150hp) Benz Bz.III in-line engine. The engine was entirely encased and featured a front car-type radiator. The fuselage and top wing had cut outs to improve visibility. The vertical tail unit comprised a triangular stabilizer and a trapezium-shaped rudder with two rounded tips. The aircraft was armed with twin machine guns entirely covered by the engine cowling. Flight tests were conducted in the summer of 1916. The fighter’s performance was much worse than that of the Halberstadt and Albatros aircraft. It was not mass produced. One of the most interesting designs was created by the L.F.G Roland works. It was the Roland D.I with a wooden, semi-monocoque fuselage structure typical for the company. The L.F.G. factory burned down on September 6, 1916. The fire was allegedly started by the British intelligence. A new factory was built in Charlottenburg. To maintain aircraft production and to save the collapsing15 Pfalz works, the Idflieg ordered 20 Roland D.I aircraft to be built in the Pfalz Flugzeugwerke. The machines received military numbers 1680–1699/16. To produce the Rolands the company adopted the WICKELRUMPF semi-monocoque technique which became a standard for the Pfalz factory. 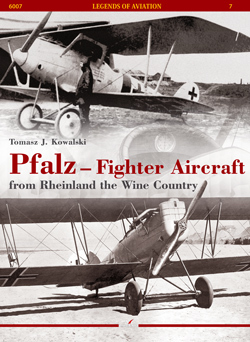 In September 1916 they began making aircraft under designation Pfalz D.I or Roland16 D.I (Pfal). The aircraft was powered by a six-cylinder, water-cooled, 118kW (160hp) Mercedes D.III in-line engine and reached speeds up to 180km/h. The Roland D.I had the same disadvantage as the Roland C.II – poor forward and downward visibility that made dogfights and landings difficult. The flaw was remedied and the Roland D.II created. To improve visibility, the top wing attachment point was rebuilt, its thickness was reduced by 10cm. The design also featured radiators installed in the upper wing and a lowered pilot’s seat. Tests were successfully concluded in October 1916 and the Pfalz works received an order for 100 Roland D.II aircraft. The machines received numbers 2830–2929/16. They were built under the initial designation Pflaz D.II (Roland D.II [Pfal]). During the production process, the Mercedes17 was replaced by a 132kW (180hp) Argus AS.III engine. The aircraft powered by that engine was designated Pfalz D.IIa. The the Pfalz works received the Idflieg order for further 100 planes with numbers 300–399/17. Initially they were designated Pfalz D.IIa which was later changed to Roland D.IIa (Pfal). The Pfalz company launched production of another Roland version. It was the Roland D.III with the upper wing placed above the fuselage which greatly improved forward visibility. The Idflieg ordered 100 new machines under designation Roland D.III (Pfal). Only 30 fuselages had been built before the production was cancelled. The construction was a great lesson for the designers and workers of the Speyr factory. Soon a new French fighter aircraft appeared over the front at Verdun. The Nieuport 11C1 and later the Nieuport 16C1 and 17C1 proved superior to the Fokker and Pfalz monoplanes and the D-type18 biplanes which were less manoeuvrable. Captured Nieuports were thoroughly tested by the Idflieg specialists. They became obsessed with the Nieuport which resulted in an order for an aircraft of a similar sesquiplane design. Some of the German aviation producers like Euler and Siemens Schuckert chose the easy way and presented copies of the Nieuport as their own designs. The Albatros and Pfalz prepared their original constructions. At the beginning of 1917, the Pfalz company employed engineer Rudolf Gehringer who had been working under supervision of engineer Theodor Kober at the Friedrichshafen Flugzeugbau works. He became the chief constructor and remained in the position until the end of the war. His closest co-workers were engineers Paulus and Goldmacher. A captured Nieuport was delivered to Speyr. It was thoroughly tested and measured. Following the Idflieg requirements, the team began working on a new fighter aircraft in the sesquiplane configuration. With a perfect semi-monocoque fuselage already designed, the constructors decided to use that kind of structure in a new aircraft. It was powered by the 118kW (160hp) Mercedes D.III engine. Wooden, two-spar wings were connected by U-shaped struts that made the construction resistant to the flutter effect that plagued the Nieuports and Albatros D.III and D.V fighters. The armament consisting of two Spandau LMG 08/15 machine guns was installed in the fuselage to limit drag. The semi-monocoque (wickelrumpf) fuselage structure demanded huge efforts which significantly extended19 the construction time. First, two halves of the fuselage were formed with stripes of plywood glued around a mold – 1mm thick and 9cm wide veneer was placed obliquely to the axis of symmetry at 45° angle. The next layer was laid in the opposite direction. Attachment points were strengthened with fabric stripes. The construction used cold glue technique. Both halves were attached to a light wooden structure made of frames and longerons. A wooden engine mount was in the front section of the fuselage. The whole structure was thoroughly polished and covered with fabric. The vertical stabilizer was an integral part of the fuselage similarly to the lower wing attachment points. The fuselage shape was very aerodynamic and the engine, protruding forward, was covered with aluminum fairing. The trapezoid-shaped, two-spar upper and lower wings were made of wood. The upper wing was attached to the fuselage with an inverted U-shaped strut. The lower wing was attached with special braces. The wing cellule was stiffened by steel wires. The upper wing housed a Teves und Brown radiator with manually operated shutters and an auxiliary header fuel tank. The wooden horizontal stabilizer was an inverted airfoil section that made it easier to recover from a dive. The elevator and rudder had a metal structure covered with fabric. The rudder of the prototype aircraft was a slightly rounded rhomboid and was unbalanced. The wooden unbalanced ailerons were installed only in the upper wing. The classical two-leg undercarriage and the wooden tail skid had rubber wire shock absorbers. The aircraft was test flown in the spring of 1917 and after minor corrections presented to the Idflieg. Its performance was similar to the Albatros D.III and, as it later turned out, was not subject to the flutter effect of the lower wing. In April 1917 the Idflieg, or Flugzeugmeisterei der Inspektion der Fliegertruppen20, ordered 70 Pfalz D.III fighters and further 300 in June 1917 after the aircraft had successfully passed the Typenprüfung. The orders saved the factory from financial catastrophe. The first three Pfalz D.III aircraft were sent to Jasta 10 at the end of July and at the beginning of August 1918. Pilots who flew the fighter reported difficulties reaching guns in case of a jam. They also claimed that horizontal speed was lower than that of the Albatros D.III and D.V, however they liked the fighter’s performance in a dive that was superior to the Albatros. Visibility and climb rate was very good. The Pfalz was less manoeuvrable than the Albatros. In the autumn of 1917, Manfred von Richthofen wrote a letter to Anthony Fokker which contained features that should characterize a fighter aircraft: high horizontal speed, climb rate is not important, full throttle turn without altitude loss, high diving speed and easy recovery, machine guns placed together atop a fuselage at pilot’s eye level. The Pfalz D.III implemented only some of those features. The construction team from Speyr experimented constantly to improve the aircraft’s performance. Trials included a 143kW (195hp) V-8 Benz Bz.IIIb engine and an eight-cylinder, 147kW (200hp) Adler Ad.IV. Lack of perspectives to acquire the engines made the constructors suspend the trials. It is highly probable that the aircraft were the Pfalz D.IV and Pfalz D.V, however it is difficult to find any information about them.